Despite the brunch mammoth Le Diplomate setting up shop two blocks over, you still have to bang down the doors to brunch at Birch & Barley, and for good reason! If you score a scrumptious table, immediately look to the menu’s sidebar under “sweets.” It’s there that you will find the Best Thing on the Menu: Freshly Fried Donuts. You get three per order (two biggies and a donut hole). The flavors? Toffee-Bacon, Lemon-Poppy Glazed and Bittersweet Chocolate. Let’s hone in on the toffee-bacon delight. It’s savory/sweet and sticky enough that your fingers will feel like you were doing arts and crafts with toddlers all day. But you weren’t, you were indulging on a serious donut that will change the way you feel about this humble pastry forever. Other brunch menu standouts at Birch & Barley include the corned beef hash, whiskey French toast and a side of PA-style scrapple (mmmmm pork mush). 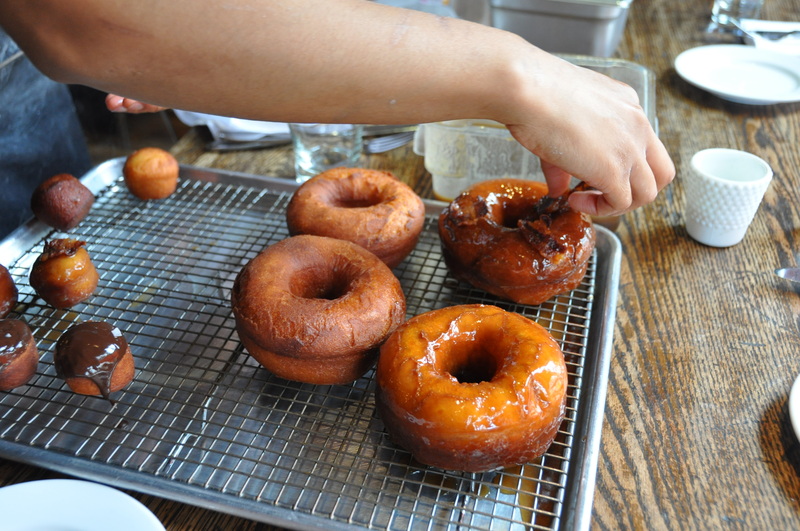 If you really dig the donuts at Birch & Barley, there’s no excuse for failing to try GBD. There, you’ll find donuts from the same mastermind, Pastry Chef Tiffany MacIsaac, AND fried chicken. 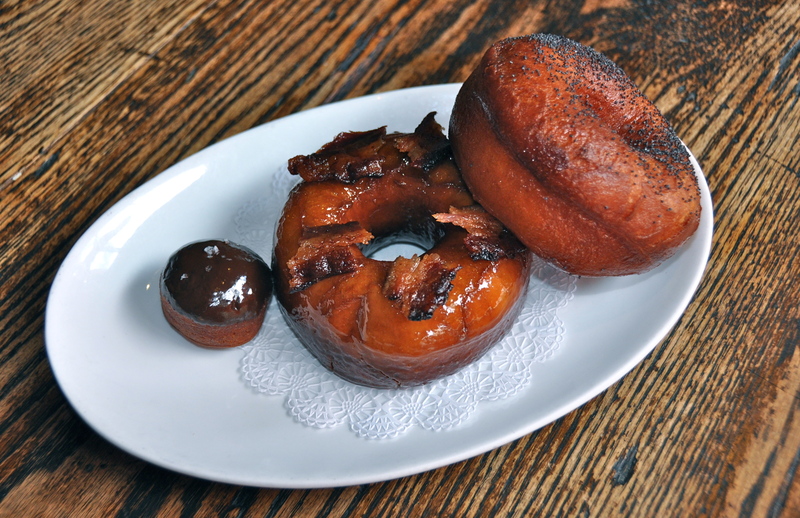 They have a maple bourbon glazed donut also topped with bacon, plus a PB&J donut that revolutionizes the elementary school lunch original. Freshly fried donuts not your BTM? Post your favorites in the comments section. This entry was posted in Restaurants and tagged 14th Street, Bacon, Best DC donuts, Birch and Barley, bourbon, Brunch, Corned Beef Hash, Donuts, Doughnuts, Logan Circle, Neighborhood Restaurant Group, Tiffany MacIsaac, Whiskey french toast. Bookmark the permalink. With respect to a B&B brunch…NOTHING beats the simple-sounding sausage egg and cheese biscuit. The best breakfast sammie I have ever experienced – made even better by being served on an amazing homemade biscuit. The “Boozy Brunch” deal (donuts, drinks and an entrée) is the perfect way to start your Sunday if you want to spend the rest of the day napping.